Wells-next-the-Sea is a small Norfolk holiday town with a harbour (popular for crabbing), independent shops, restaurants and pubs, and a sandy beach. The beach is one mile from the centre, but can be reached by a miniature train from the quayside during the holiday season. This pretty cottage is only a few yards from Wells quay, a short walk from the town centre attractions, and the sandy beach is one mile away. 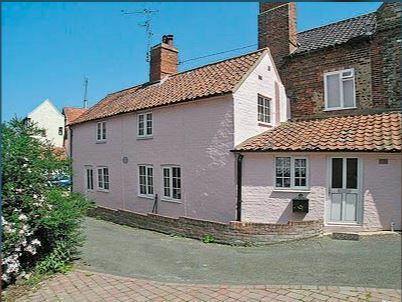 Traditional holiday cottage with an enclosed garden in the centre of Wells. Shops and pubs only 800 yards. A detached bungalow close to the quay, shops and cafes. It has a small garden with a patio and parking spaces for two cars. Comfortable whitewashed cottage with sea views from bedrooms, close to the town attractions: quay, shops, restaurants and pubs. A comfortable end-of-row town house set in a peaceful courtyard only a few yards from the pretty quayside at Wells-next-the-Sea. Shops and pub 200 yards. End-of-row cottage only a few yards from the attractive quayside at Wells-next-the-Sea. The cottage is a short walk from the town centre and a mile from the sandy beach. Located in the pretty conservation village of Stiffkey, four miles from Wells-next-the-Sea and a short walk from saltmarshes, beaches, creeks and the sea. Comfortably furnished and has a half-acre, south-facing garden with fruit trees and beautiful views across rolling countryside. This detached holiday cottage has a large lawned garden. It is furnished to a high standard and is well-equipped. There is a wood-burning stove in the living room, seating for twelve people in the dining room and a sheltered decked terrace overlooking the garden. Wells-next-the-Sea with its wide sandy beach and quay is two miles away. This fine historic house is only a five-minute walk from Wells harbour and the sea. Wells beach can be reached by a 15-minute walk through a wood. It has a large south-facing rear garden and a patio, perfect for outside dining. Only 200 yards from Wells quay, fishing harbour and town centre, this attractive barn conversion has a wood-burning stove and beams in many rooms. A three-storey townhouse in the centre of Wells, and only a two-minute walk from the harbour and the sea. The pretty rear garden and patio area are enclosed by a high wall. The bedrooms are spacious and have lovely views along the coast. Close to the sea and with great views across the harbour, quay and marshes, this detached cottage has a Juliet balcony from the first floor lounge and LED TV with Freeview in every bedroom. Packed with character, the cottage has a beamed living room and is next to the quay. Spacious and comfortable 18th century detached holiday cottage with enclosed garden in a peaceful village three miles from Wells-next-the-Sea. The cottage has a beamed living room with wood-burning stove. A spacious detached house set in enclosed gardens only a short walk from Wells fishing quay and shops, pubs and restaurants. A mile away from the pine woods and sandy beach. Set in the centre of Wells town, an easy stroll from the harbour, shops, cafes and pubs. The cottage has an electric woodburner in the living room, gas central heating, bed linen and towels included, wi-fi, an enclosed courtyard garden with patio, and a parking space for one car.